The species is confined to south-east of a line from the Wash to the Severn. It is widespread in western and central Europe, but has not been recorded from Ireland or Denmark. M. formicaria usually occurs on some type of grassland, sometimes very near the beach and on under-cliff. There are many records from chalk grassland but also stony cliff ledges, saltmarsh, marram and fens. 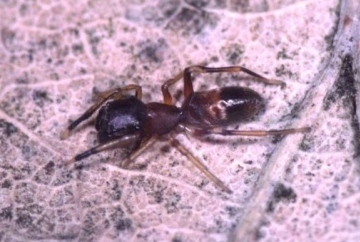 Jones-Walters (1997) reports it as relatively common in the New Forest mires where the common ant Myrmica scabrinodis is abundant. It is an ant-mimic, usually found in company with ants, either running among grass or under stones. Both sexes are adult from May to July, with females until September. The spider is very local, but fairly numerous at some sites and is possibly most frequent in damp places on under-cliff. Most of its coastal sites are too inaccessible to be liable to any specific threat, although some have recently been covered by landslides. Some of its chalk grassland, fen and mire sites might be vulnerable to agricultural changes or drainage respectively. None needed on coastal sites, but maintain chalk grassland by traditional grazing and maintain water table in fens.